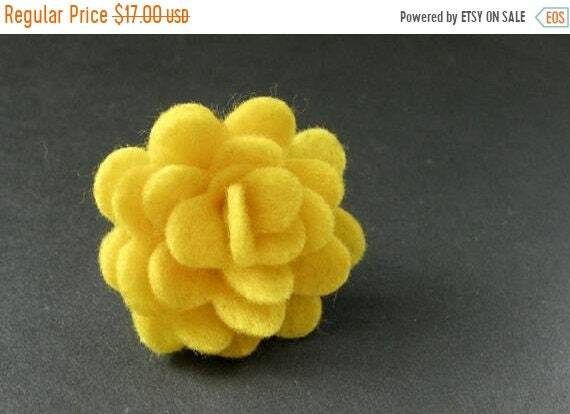 EASTER SALE Felt Flower Ring. Yellow Flower Ring. Felt Ring with Aged Silver Adjustable Ring Base. Handmade Jewelry. Felt Flower Ring. Yellow Flower Ring. Felt Ring with Aged Silver Adjustable Ring Base. A handmade felt flower in a vibrant shade of yellow has been set upon an aged silver tone ring base in this handmade adjustable flower ring. This handmade felt ring has been made with an adjustable ring base which makes it comfortable to wear no matter the size of the wearer's fingers (size 7 and up) as well as ideal for switching from finger to finger depending on mood or preference. EASTER SALE Yellow Rose Ring. Yellow Flower Ring. Filigree Ring. Adjustable Ring. Flower Jewelry. Handmade Jewelry. EASTER SALE Cocktail Ring: Tigers Eye Swirl Glass Stone Ring with Adjustable Ring Base. Handmade Jewelry. Yellow Flower Cluster Earrings. Yellow Flower Earrings. Silver Post Earrings. Stud Earrings. Flower Jewelry. Handmade Jewelry. Yellow Sunflower Earrings. Yellow Flower Earrings in Bronze. Stud Earrings. Handmade Jewelry. Rose Flower Earrings in Aqua and Silver Post Earrings. Flower Jewelry by StumblingOnSainthood. Handmade Jewelry. Red Rose Flower Earrings with Bronze Post Earrings. Flower Jewelry by StumblingOnSainthood. Handmade Jewelry. HOLIDAY SALE Black Rose Ring. Black Flower Ring. Filigree Ring. Adjustable Ring. Flower Jewelry. Handmade Jewelry. Prompt shipping, quality product! Came exactly as pictured, couldn't be happier! Would definitely order from this seller again, if only all purchases could be this easy...!!! Black Rose Ring. Black Flower Ring. Filigree Ring. Adjustable Ring. Flower Jewelry. Handmade Jewelry. Red Rose Ring. Red Flower Ring. Filigree Adjustable Ring. Flower Jewelry. Handmade Jewelry. Pink Rose Ring. Pink Flower Ring. Adjustable Ring. Filigree Ring. Flower Jewelry. Handmade Jewelry. EASTER SALE Aqua Rose Ring. Aqua Flower Ring. Filigree Ring. Adjustable Ring. Flower Jewelry. Handmade Jewelry. EASTER SALE Black Rose Ring. Black Flower Ring. Filigree Ring. Adjustable Ring. Flower Jewelry. Handmade Jewelry. EASTER SALE Ivory Rose Ring. Ivory Flower Ring. Adjustable Ring. Filigree Ring. Flower Jewelry. Handmade Jewelry. EASTER SALE Yellow Rose Ring. Yellow Flower Ring. Gold Ring. Silver Ring. Bronze Ring. Copper Ring. Adjustable Ring. Handmade Jewelry.